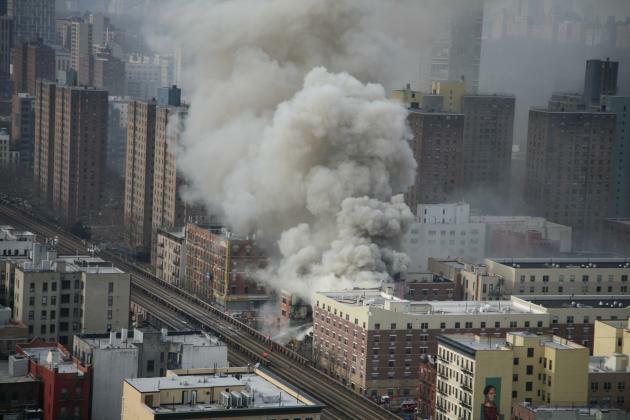 A massive explosion followed by a fire and collapse of a pair of apartment buildings in upper Manhattan on Wednesday has left at least three people dead and more than 60 injured, officials say. The extent of all injuries wasn't immediately known, but earlier in the day fire officials said seven people were in serious condition, including two with life-threatening injuries. Rescuers are currently combing through bricks by hand in an effort to locate other possible victims. More than a dozen people are reportedly unaccounted for. The blast shattered windows and crumbled walls up to several blocks away from the explosion. Residents in the neighborhood told reporters they feared the earthshaking boom was a terrorist attack. One man was so worried, he told CNN, that he rushed out of his home wearing nothing but his underwear. "This is a tragedy of the worst kind," de Blasio said. "There was no indication in time to save people." Based on preliminary information, the mayor said, “The only indication of danger came about 15 minutes earlier when a gas leak was reported to Con Edison. Con Ed dispatched a team to respond. The explosion occurred before that team could arrive." Con Edison spokesman Bob McGee said that the company received a call from a resident of an adjacent building who reported smelling gas inside "but indicated the odor may have been coming from outside the building." Two Con Ed crews were dispatched at 9:15 a.m. but arrived just after the explosion. Ruben Borrero, a resident of one of the flattened buildings, told the Associated Press that the smell of gas was “unbearable” and residents complained about it repeatedly, even as recently as Tuesday. Con Edison says it received no gas complaints from the building before Wednesday, the AP reported. Police, including some wearing gas masks, "handed out medical masks to residents and onlookers because of the thick white smoke that shrouded the area." The fire department responded with 44 units and more than 250 firefighters to the five-alarm incident. According to public records, the address that firefighters initially responded to — 1646 Park Ave. — was built in 1910. Reached by phone, an employee of the man who owns the building told Yahoo News that she didn't know what might have sparked the blast. The five-story building is home to four floors of apartments and Absolute Piano on the street level. The employee said everyone at the piano shop was safe. According to public records, the neighboring building — 1644 Park Ave. — is home to apartments and the street-level Spanish Christian Church. “I’ve never had anything this horrific that’s happened in my community since I’ve been in Washington,” Rep. Charles Rangel, who represents Harlem, told NBC's New York affiliate. “This is a very serious thing. It’s our community’s 9/11, even though we don’t know how it started." "I saw a lady running with no shoes on," another told Agence France-Press. "It was crazy. It was like a war zone. ... I thought it was an earthquake. I got calls from my family who felt it too and that was all the way uptown." The blast was picked up by earthquake seismometers in the area, including one in nearby Central Park and another — Columbia's Lamont-Doherty Earth Observatory — some 16 miles north. According to the White House, President Obama was briefed on the incident in New York by Lisa Monaco, assistant to the president for homeland Security and counterterrorism. Photos posted to Twitter showed smoke and dust coming from the neighborhood north of Central Park, and firefighters searching the rubble for victims.